This weekend, LAPD is targeting drunk drivers through hosting DUI checkpoints at certain locations around the city. Mr. Ticket warns drivers about these checkpoints and the consequences of a DUI charge. The LAPD is now targeting drunk drivers through DUI checkpoints. These checkpoints are designed to get more drunk drivers off the streets and prevent alcohol-related traffic collisions. Mr. Ticket warns Los Angeles drivers about the consequences of a DUI charges, and urges them to avoid drinking and driving. Every year, Los Angeles sees more than 2,000 traffic collisions related to DUIs and DWIs, and these accidents typically cause injuries, fatalities, as well as thousands of dollars in damage. 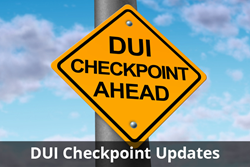 DUI sobriety checkpoints are just one strategy designed to get drunk drivers off the streets and achieve the goal of Vision zero, which is to end traffic collision deaths by 2025. Many drivers are unaware of how little alcohol it takes to reach the legal limit, which, in California, is 0.08 percent for drivers over 21. Just two to three drinks can take a 100-pound person to the edge of legal intoxication while someone who is 160 pounds may reach his or her limit within just three to four drinks. The best way to avoid getting a DUI or reckless driving charge is to avoid drinking entirely when out or to designate a sober driver. 77th Street Area - Thursday, May 5, 2016, 5 P.M. to Friday, May 6, 2016, 1 A.M.
Harbor Area - Thursday, May 5, 2016, 5 P.M. to Friday, May 6, 2016, 1 A.M.
Newton Area - Thursday, May 5, 2016, 5 P.M. to Friday, May 6, 2016, 1 A.M.
Southwest Area - Thursday, May 5, 2016, 5 P.M. to Friday, May 6, 2016, 1 A.M.
Florence Avenue at Main Street in Los Angeles - Thursday, May 5, 2016, 8 P.M. to Friday, May 6, 2016, 2 A.M.
Highland Avenue at De Longpre Avenue in Los Angeles - Friday, May 6, 2016, 8 P.M. to Saturday, May 7, 2016, 2 A.M.
Florence Avenue at Central Avenue in Los Angeles - Friday, May 6, 2016, 8 P.M. to Saturday, May 7, 2016, 2 A.M.
Van Nuys Boulevard at Roscoe Boulevard in Panorama City - Friday, May 6, 2016, 8 P.M. to Saturday, May 7, 2016, 2 A.M.
Newton Area - Saturday, May 7, 2016, 5 P.M. to Sunday, May 8, 2016, 1 A.M.
Florence Avenue at Main Street in Los Angeles - Saturday, May 7, 2016, 6 P.M. to Sunday, May 8, 2016, 12 A.M.
Sherman Way at Kelvin Avenue in Canoga Park - Saturday, May 7, 2016, 8 P.M. to Sunday, May 8, 2016, 2 A.M.
Times and locations are subject to change or cancellation. Drivers are encouraged to designate a sober, non-drinking driver and to drink responsibly during their nights out. The consequences for driving under the influence can be severe and may include fines up to $10,000 or more, jail time, license suspensions, or restrictions, high insurance rates and personal, professional, and social consequences. Mr. Ticket offers consultations and legal assistance for those who are facing charges for driving under the influence. Legal representation can help those who are facing charges to get the best possible outcomes. Mr. Ticket also offers representation to those who are facing tickets or charges for other traffic-related violations, including those from DUI sobriety checkpoints, reckless driving, speeding, hit-and-run tickets, cell phone tickets, and overweight tickets for commercial drivers.